To say that furniture runs in a family’s blood might sound a bit odd, but when talking about the Hope and Mike Glover family, the saying would be true. Especially when the Glovers’ children, Amy and Tiffany, were literally raised in the furniture business. “Our daughter Amy visited the flea market store we had before ever coming home from the hospital after being born,” Hope Glover said. 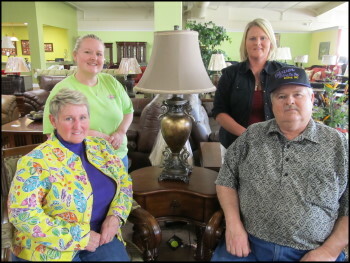 The Glovers entered the furniture world 28 years ago, buying antiques and used furniture at auctions. Hope was a lab technician at the time and Mike was farming. “We started selling furniture simply as a way to make a little extra money,” said Mike Glover, who sold his first couch for $45. “Back then, that was a lot of money.” In 1976, they opened a new and used furniture store in Bailey and Hope quit her lab job to work in furniture full time. Around the same time, Mike went to auctioneer school and they started an auction business near Bailey. When their second-born, Tiffany, announced that she intended to join the family business, Hope and Mike decided to open a second store, to be located right next to the first store. For three years, Hope’s Furniture worked out of two locations. “We decided to build the third store so that when I got out of the business, it would be in one location for the girls,” Glover said. “We love it under one roof. It’s amazing. Looking back, I don’t know how we worked in two locations.” The current Hope’s Furniture store opened around Christmas of 2010. The 30,000 square foot building holds furniture and home accessories for every room in the house and every person’s taste. But as important as the variety and quality of the furniture are, Glover feels that treating customers fairly and like family is even more important. “The customer buying a couple lamps is just as important as the person buying $10,000 worth of stuff,” said Glover. “The people buying the lamps might come back, so we want their first experience to be a good one.” Many of their customers simply stop by to chat, especially if they live out of town. Hope’s Furniture is open Monday – Saturday, 10 a.m. to 5 p.m.